The landmark 1st Malaria World Congress 2018 (MWC2018) raised awareness internationally about the huge global challenges to eliminate this devastating disease. Find out more. Burnet’s malaria researchers and Congress Founder, Professor Brendan Crabb AC played a key role. Every two minutes a child dies from malaria. Imagine the devastating impact this has on families and their communities. Malaria is an acute febrile illness caused by different species: Plasmodium falciparum, P. vivax, P. ovale, P. malariae and P. knowlesi. Falciparum causes the majority of malaria disease globally but P. vivax is a second important cause of malaria and causes a high burden of disease in the Asia-Pacific region. A parasite called Plasmodium, which is transmitted via the bites of infected mosquitoes causes malaria. In the human body, the parasites multiply in the liver, then infect red blood cells, and if not promptly treated, may lead to death. Despite a major reduction globally in malaria-related mortality rates through prevention and treatment efforts, more than 430,000 people – mainly young children – are still dying each year from this preventable disease. According to the World Health Organization (WHO) more than 90 countries are impacted by malaria, many in the Asia-Pacific region. 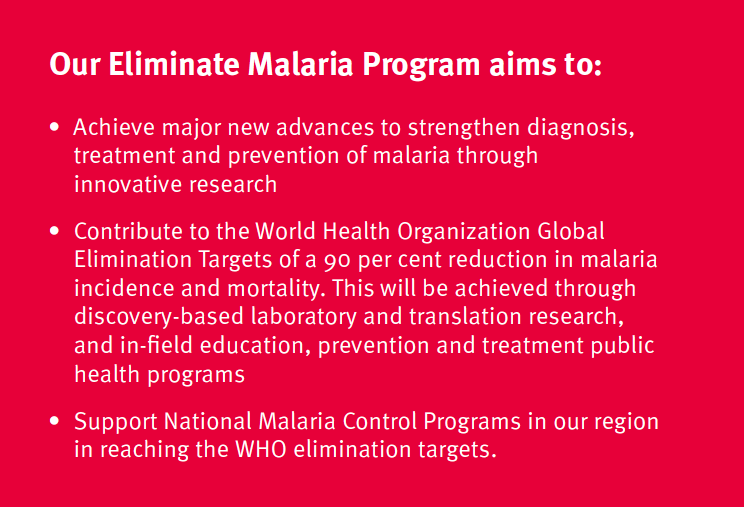 Australia’s and the global response towards eliminating malaria requires a dual approach of preventing infections and stopping malaria-related deaths. Burnet Institute is committed to making a major contribution in efforts to eliminate malaria as a public health threat, particularly in the Asia-Pacific region. 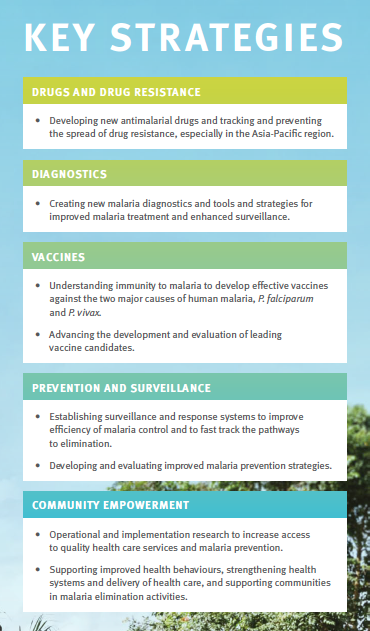 We work with partners in Australia and internationally, especially in malaria-endemic regions in the Pacific, Southeast Asia and East Africa (including Papua New Guinea, Myanmar, Vietnam, Lao PDR, Kenya, and Cambodia). We also collaborate with industry partners in development of vaccines, diagnostics and therapeutics. Discovering new insights into how drug resistance may emerge in populations and how to better quantify and monitor its spread. Identified new antimalarial compounds with potential for development into drugs. Identified immune responses that protect against malaria and new approaches for vaccine development. Developing new low-cost diagnostic tests to guide the treatment of malaria. 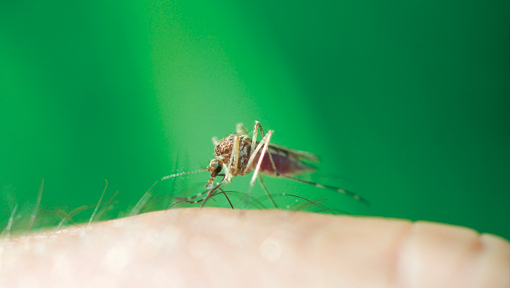 Developing novel tools to enhance surveillance and tracking of malaria in populations. In affected communities created strategies to address gaps in health services and coverage to improve diagnosis, treatment, and prevention. According to the WHO, antimalarial drug resistance is a major concern for the global effort to control malaria. P. falciparum resistance to artemisinins has been detected in four countries in Southeast Asia: Cambodia, Myanmar, Thailand and Vietnam. There is an urgent need to expand containment efforts in affected countries. For now, ACTs remain highly effective in almost all settings, so long as the partner drug in the combination is locally effective. Assessing the importance of immune responses directed against unstructured proteins from Plasmodium species. What is the prevalence of iron deficiency anaemia, how is it associated with adverse birth outcomes, and is the association modified by malaria? This project is looking at the development of a blood stage vaccine against the Plasmodium falciparum species of malaria. By understanding how parasites gain entry to human cells we can develop drugs that block and then paralyse the parasites so they can do no more harm.